Greetings! My name is June and I am the maker behind MOTH & TWIG Mosaic Art Jewelry. Thank you for stopping by. I was born in San Francisco and lived all over the Bay Area until the late 1960s. when my family relocated to the Philippines. It was there that I became enthralled with the beauty and wonder of the natural world. As a child, I spent many hours exploring the wilds around me. Unbeknownst to me at the time, my experiences in the Philippines would set the stage for how I would view life and art. We spent the next years moving; forever moving. Up and down the California coast, Washington state, Maryland, and Tennessee to name a few. After the Philippines, Washington state was by far one of my favorite areas to live, thus my love for the Pacific Northwest. As an adult, I spent 15 years working in the fashion industry on production and design. It was a fun and creative time. I attended college part-time and eventually earned undergraduate degrees in psychology and biological anthropology. I am certain my time in the Philippines led me to study anthropology with a focus on primatology. Because of my many interests I couldn't see myself doing just one thing for my entire life, so I later studied psychology which culminated in a Masters Degree in Counseling/Marriage Family Therapy. However, my most important focus in life has been being a mother. I raised my loving son, Evan, who resides here in Portland. Other than motherhood, my two main focuses throughout life have been nature and the arts, with the latter incorporating various forms including improvisational theater, screen printing, fashion design, jewelry arts, and mosaic arts. In the summer of 2002 I embarked on a month-long trip to Barcelona, Spain where I spent time exploring the city and the architecture of Antoni Gaudi. My love for mosaics blossomed during my time in Barcelona. Upon returning to the Bay Area, I promptly enrolled in classes at the Institute of Mosaic Art and ended up studying mosaics for years under the tutelage of many wonderful teachers. So that I could live closer to my son, I moved to Portland in 2015 with my partner Andrew. Here in Portland I have been actively involved in the arts. I find that I am happiest when I'm working with my hands, manipulating materials into small, wearable works of art. I utilize various materials including smalti, glass, millefiori, mosaic gold, filato, and ceramic tile. 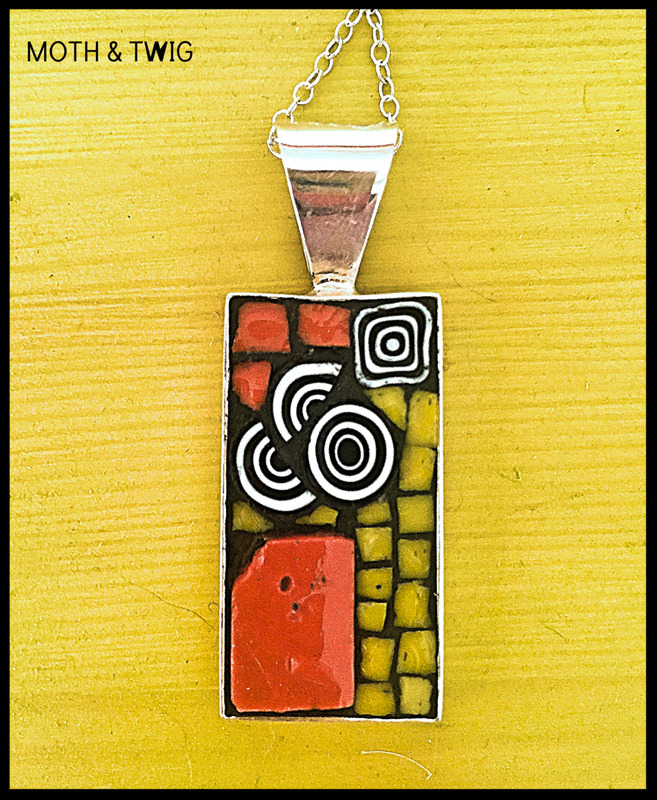 Fashioning miniature art pieces into jewelry combines my loves for jewelry and mosaic arts. I combine traditional mosaic techniques with daily experimentation. Working small scale requires patience, a steady hand, keen eyesight, and an array of interesting tools. I am inspired by nature and strong graphic patterns. I tend to favor saturated colors and often work in color palettes inspired by some of my favorite regions including the Pacific Northwest, the Southwestern U.S, the Mediterranean, and the jungles of Central America. We travel to Costa Rica often and I am currently working on a collection that is inspired by the flora and fauna of the area. In the not-so-distant future, we hope to live in Costa Rica and host mosaic art retreats. We purchased a small plot of land at the tip of the Southern Nicoya Peninsula. A piece of land where jungle meets ocean. Land where the monkeys frolic, agouti scamper, and coati explore. First and foremost, I am a mosaic artist. I also love to create unusual jewelry, so one day I decided to combine the two loves. Voila! Moth & Twig Mosaic Art Jewelry was born! I incorporate a variety of materials into my work. Sourcing the world for intriguing and high-quality materials is half the fun! Some of the materials I use include earthenware ceramic tiles that I source from Morocco, smalti, filato, mosaic gold, various pewter embellishments, stained glass, Italian millefiori, and beads to name a few. I'm always finding new materials to play with so who knows what I'll incorporate into my designs next. I use various bases including sterling silver, pewter plated in .999 fine silver, copper, or 24kt gold, sterling silver over brass, and recently, pure copper and bronze. I hand fabricate my ear wires using either argentium silver, niobium, or 14kt gold filled wire. Every piece is designed and created by me at my studio in Portland, Oregon. I pride myself in my craftsmanship. I use a variety of specialized tools to help me create my miniature mosaics including magnifying wear, tweezers, picks, a glass grinder, files, rubbing stones, just to name a few. The work is detailed and intricate. That said, I love the imperfections that are inherent in many of the materials I use. It is this combination of meticulous and imperfection that I feel makes for interesting and beautiful pieces.